We are delighted to share with you that Crystal Cruises will embark on its 25th anniversary year by celebrating a record 21 years as Condé Nast Traveler magazine Readers’ Choice No.1 “Midsize Cruise Ship Line.” Crystal’s winning score of 90.142 was the highest of all Small, Midsize, and Large-ship cruise lines, awarded this week. All Readers’ Choice winners and scores are listed at www.cntraveler.com/rca. The Condé Nast Traveler Readers’ Choice Awards are among the most preeminent in travel, honouring the best hotels, airlines, cruise lines, cities, and islands from around the world. Nearly 77,000 Condé Nast Traveler readers ranked their personal experiences with cruise lines’ itineraries, excursions, service, food, activities/facilities, staterooms and design. 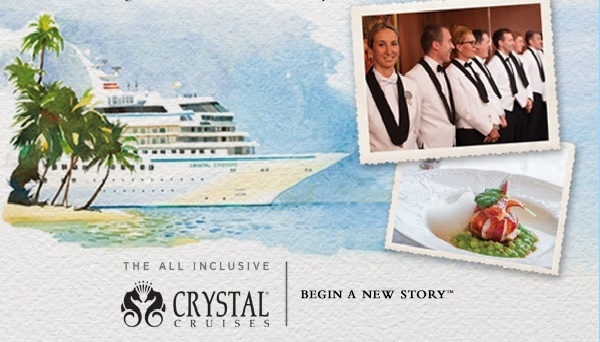 Congratulations to all the team at Crystal Cruises, both at sea and ashore, as without each and every member of staff and crew, this would not be possible.